Super Mates Episode 41: Return of the Vampire / Captain America Battles Baron Blood! Giant-Sized Finale! 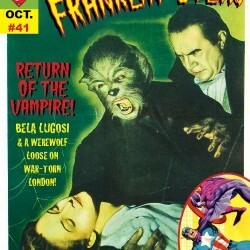 In their last, harrowing trip into the House of Franklin-Stein (for this year anyway), Chris and Cindy discuss 1943’s The Return of the Vampire starring Bela Lugosi as a vampire that is NOT Dracula. Seriously, he’s not. We mean it! In war-torn London, vampire Armand Tesla rises from his tomb to exact his revenge on those who vanquished him. Along the way we meet his werewolf minion, and even more unbelievable for a 1940s horror film, a strong female protagonist! 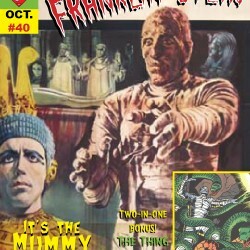 How does this Columbia release stack up to the fabled Universal Monster series? The answer may surprise you! Then, the Super Mates end the comic portions of the series in style, by taking a fond look at Captain America # 253 and 254 by Roger Stern, John Byrne, and Joe Rubenstein! The Star-Spangled Avenger answers the call of a friend and need…his old Invaders teammate, Union Jack! The aged hero is convinced a series of grisly murders are the work of his vampiric brother, Baron Blood! What follows is a timeless classic, with one of the most shocking endings of the Bronze Age of comics! Next time: Back to Opal City for the next installment of The Starman Chronicles! Plus your feedback! Host Rob Kelly welcomes longtime Nuclear Sub DEREK WILLIAM CRABBE (FANHOLES PODCAST) to talk about a Halloween favorite, George A. Romero and Stephen King’s CREEPSHOW! We can hold our breath a verrry long time! Marvel’s Secret Wars has lasted so long, it’s had the time to spawn a romance book! 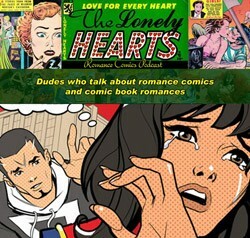 That’s right, Lonely Hearts takes a look at all five stories from the Secret Wars Secret Love one-shot, taking many meandering detours through comics and movies minutia on the journey. That’s what happens when you put these four guys in the same room. Plus, Romance Comics Theatre! Listen to Episode 5 below (the usual filthy filthy language warnings apply), or subscribe to The Lonely Hearts Romance Comics Podcast on iTunes! 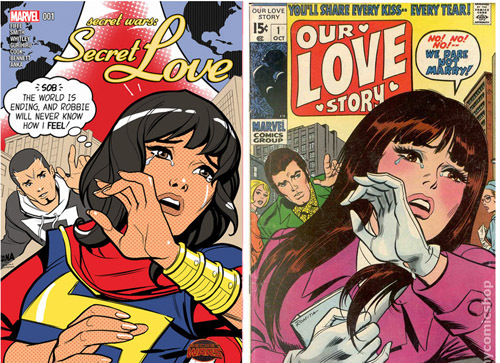 Secret Wars Secret Love’s cover is a tribute to an age-old favorite! Ryan Daly and guest Stella review the origin of Batgirl from Secret Origins #20. Then, the Irredeemable Shag returns to help cover the origin of blind hero Doctor Mid-Nite. Additional music this episode: “In the Midnight Hour” by Wilson Pickett; “Dancing On My Own” by Robyn.